Vitamin D3 is a critical biochemical that allows the body to absorb calcium and incorporate it into bones and teeth. Vitamin D3 can be obtained naturally from sunlight, in certain foods and in vitamin supplements. No benefit has been detected from taking vitamin D3 in liquid, compared with solid, form or vice versa. Vitamin D exists as two variants, known as D2 and D3. The human body, and some animals, produce vitamin D3 naturally in response to sunlight exposure. Vitamin D2 is produced in some plants and vegetation. Both forms of vitamin D can be synthetically produced in labs, and the manufactured forms of vitamin D are chemically identical to their naturally occurring types. Vitamin D enables the body to manage blood levels of calcium and incorporate that mineral into body structures that require it. Vitamin D facilitates both initial calcium absorption from the digestive tract and "remineralization," as bones and teeth are constantly strengthened by the addition of calcium and phosphorus. Inadequate vitamin D intake can lead to rickets, an illness whose symptoms include skeletal malformation and bone weakness, osteopenia, osteoporosis and other disorders. While the functions of both vitamin D2 and D3 are almost identical, findings published in the "American Journal of Clinical Nutrition" indicate that D3 might be biochemically superior to D2, with somewhat greater potency in the body. 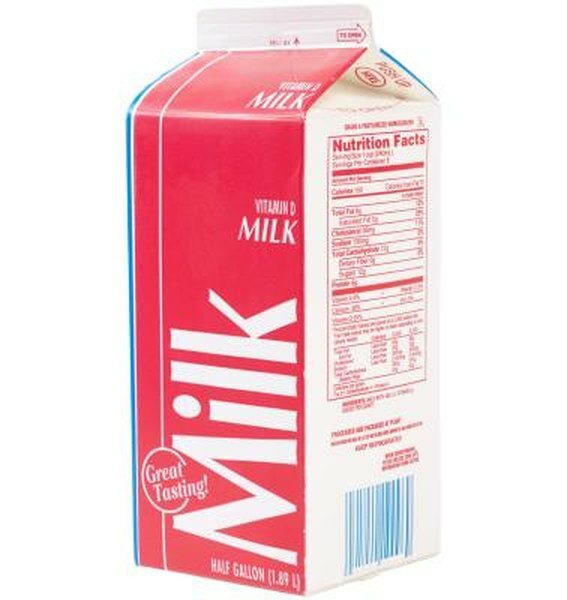 Pasteurized milk is the single most common and important source of vitamin D3 in food, and the addition of vitamin D3 to pasteurized milk has virtually eliminated childhood rickets in the U.S. A single 8 oz. cup of milk supplies about 30 percent of the recommended daily intake of vitamin D3. Certain coldwater fish such as mackerel, cod and sockeye salmon also supply some vitamin D3. Vitamin D3 is also available in many vitamin supplements. In addition to being available in food sources, the body itself can also produce adequate vitamin D3 from sunlight exposure of under 30 minutes, two or three times weekly. Chemically known as "cholecalciferol," vitamin D3 has a melting point of approximately 84 degrees Celsius, or 183 degrees Fahrenheit. This means vitamin D3 molecules are virtually always in their solid form, or phase, when ingested into the human body, regardless of whether their "carrier" substance is a liquid, such as milk, or a solid, such as fish or a vitamin pill. Because the dosage of vitamin D3 being ingested is so small, the solid form of these dissolved microscopic particles is indistinguishable to humans. No evidence indicates choosing solid or liquid forms of vitamins has any effect on potency or bioavailability. Young children, or others who have trouble swallowing pills, might find liquid supplement drops of vitamin D3 a more convenient delivery vehicle than tablets or capsules.